I have put the comment up here since I wanted to add an illustration. If you have any doubts whatsoever over a solution then it is almost certainly incorrect. You can usually forget the almost but we do occasionally see an unsatisfactory solution, even in the Listener. I had no such problems with the title: SPAD = SP + A(N)D representing odds and ends. What a strange-looking grid with its rather waspy waist and that unusual title (Signal Passed at Danger?) I expected a red light somewhere along the line here. 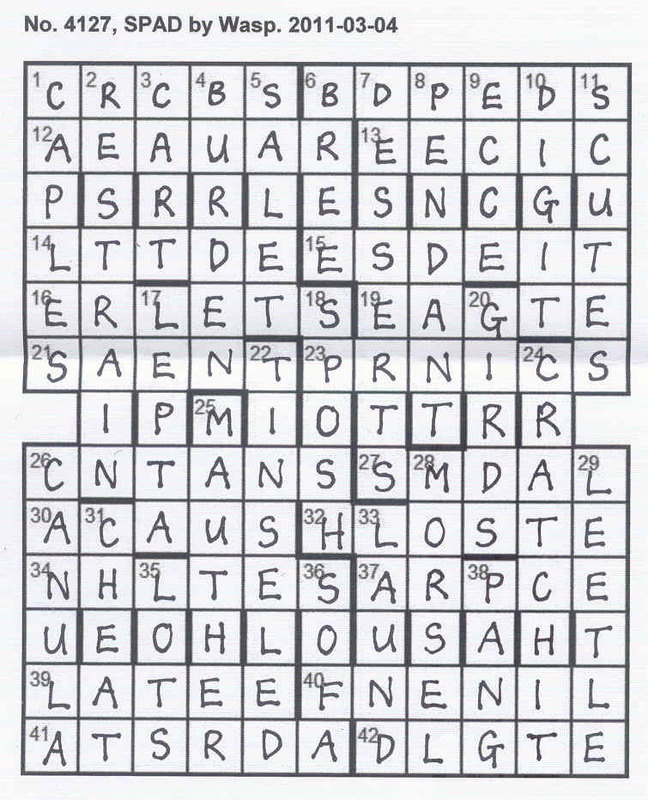 Solving went very quickly and, when we found SOFA, LAUND, PANG and LEETLE with a putative MORSEL (Bit of stone found in cherry) and CRATCHIT (End of government supporter’s testimonial) as two clues without definition, we had a method of entry for a ten-letter word. FINGERNAIL had to be entered as FiNgErNaIL or XxXxXxXxXX. This fitted HaLlOySiTE and clearly could be applied to the ten-letter words. ‘Cratchit’ was a red signal to us. It isn’t in Chambers so clearly had some function in the crossword that we were going to have to decipher. It didn’t take us long to work out that eight-letter words had to be entered with a similar pattern. SoMeDeAL, ElEnCtIC and so on. Soon we had a full grid and no idea at all what our eight words (RESTRAIN, BURDEN, PENDANT, DIGIT, CRATCHIT, MAUTHER, MORSEL and CHEAT) were telling us about the entry method for words that we thought we had already entered! This was disconcerting. There had to be a reason for that preamble. I always hear Erwinch saying, ‘If you are not sure of your solution, then it is probably not correct’. Were we expected to enter all those other letters as little ones, or perhaps perform some unusual cutting, colouring and glueing to create a Rubik’s cube with little doors that opened and revealed battered wrens? Where was the habitual Listener hoop to jump through at the end? Chambers completed the picture. What does it have under BITS AND BOBS but ODDS AND ENDS and those were precisely what we had selected from the across clues – odd letters and the ends. Sadly, we discovered the entry method in this way after we had actually entered our words but it was reassuring to find the logic of the whole procedure and that was obviously why Wasp had made those two sets of four words that were very subtly concealed. We did wonder whether the Listener powers that be should have insisted that a box underneath the grid contained that ‘Bits and Bobs’ phrase, so that solvers would need to confirm that they had followed the complex trail that Wasp had laid for us. But it is too easy to be critical after the event isn’t it? We were left with our hesitation about that signal passed at danger – or was it an old aircraft to go with the Sopwith Camel that was performing in 37ac? Aah, now isn’t SP starting price? The Odds of the title! So AnD ends must be the ends of ‘and’. Another piece of subtle wordplay that echoed the entry method. 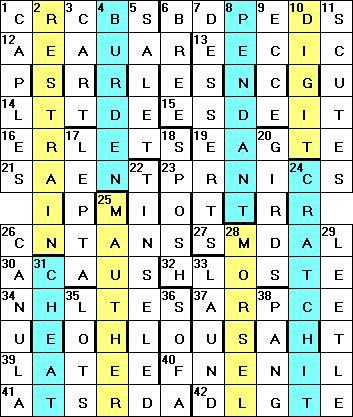 I felt that the impressive quality of the clues in this crossword almost led to a problem, since solvers probably quickly worked out the entry method. We might not have solved it in the wrong order, had the clues not been so flawless. Many thanks, Wasp. This week we have SPAD by Wasp, and what looks like one of the shortest preambles for sometime. Unfortunately, it indicated that all the across answers had to be modified in some way before entry. Still, eight down entries which were clued without definition and belonged to one of two groups would reveal all, I hoped. 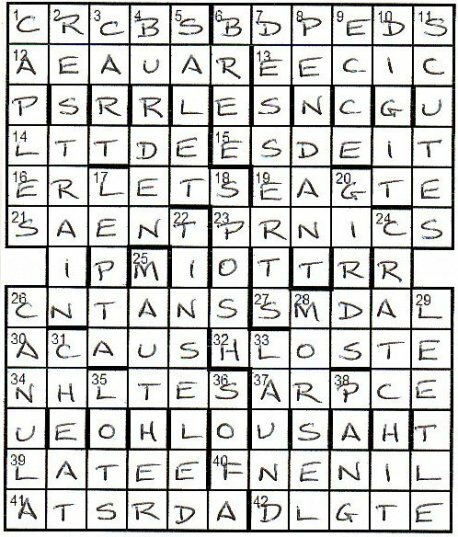 What’s more, the figures in brackets for the across clues did not tally with the size of the grid entry; it looked like we were being given a helping hand on this puzzle; many setters would probably make us work that out for ourselves. Although 1ac eluded me, 6ac was BEDSPREADS, followed two clues later by what looked like an anagram of CLIENT in EC and was ECLENCTIC, a bit of a tongue-tier. 14ac LATITUDE and 16ac ENROLMENTS were straightforward, but 19ac, a mineral anagram of TEARING and E wasn’t revealed by Bradford’s (it later turned out to be EGARNITE). The only other across answer that I got on this first pass was 40ac FINGERNAIL. Not particularly fruitful acrosses, and of course nothing could be entered firmly since they all needed to be changed before entry. Perhaps the down clues would be more forthcoming. They started well with 5 SALET, 6 BREE and 8 PENDANT. 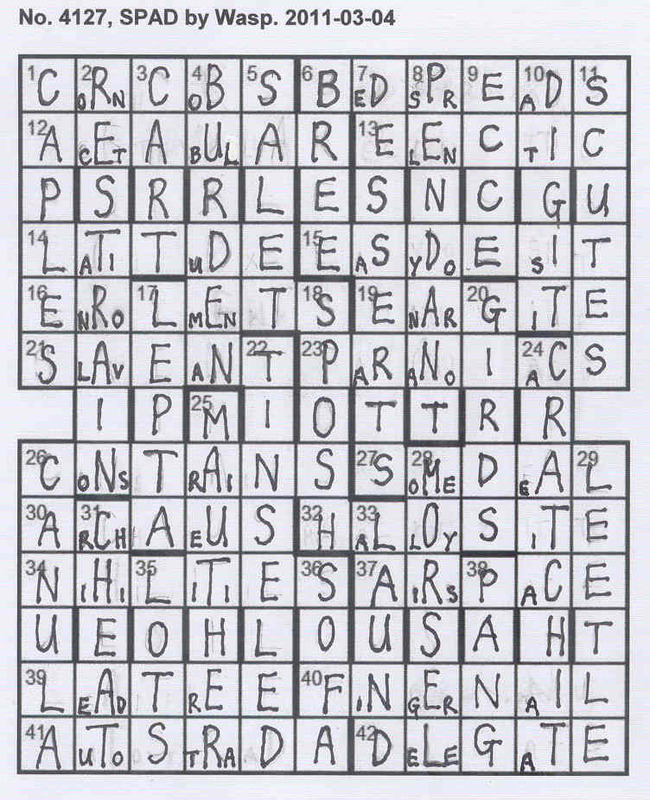 This last was the first clue without a definition, and with 9 ECCE, I had 6ac (remember BEDSPREADS) having to fit B.PE.. so it looked as though some letters were perhaps to be removed before entry of across answers. Not bad for 20 minutes into the puzzle. 17 LEPTA, 20 GIRDS, 31 CHEAT (without definition), 33 LAUND and 36 SOFA finished the downs and I had to admit that the grid looked rather sparse, so perhaps my optimism at the 20 minute mark was ill-placed. EASY + DOE + SIT and it took me ages to get! BIN with URDE instead of I, and a great surface reading with its warning to motorists! All in all, good clues, and I suspect that it was not an easy grid fill for Wasp. And so to the endgame. I was left with (all nicely symmetrical in the grid) RESTRAIN, CHEAT, BURDEN, MAUTHER, PENDANT, MORSEL, DIGIT and CRATCHIT as the thematic answers which fitted into two groups. Well after staring at them for a few minutes, they didn’t look even vaguely thematic to me. They were, after all, just words, if you know what I mean, apart from CRATCHIT who is a Dickens character! So my guess was that the words had a certain pattern, but again none emerged. And what was with the title? SPAD, according to Chambers, is the abbreviation for Signal Passed At Danger. Well that seemed to indicate that I had passed some sort of indication that was intended to alert me to the theme, but obviously didn’t. Perhaps it was something to do with binary 10101011 but although I work with computers I couldn’t fathom it. Those of you who read here regularly will probably know how important I think it is to fully understand every aspect of a Listener. Rarely do I fail at this, and I felt it was just a matter of time before it all fell into place. Except that it didn’t, and the thematic groups completely eluded me! Luckily we weren’t required to put anything under the grid that revealed whether we had fully worked out whatever they turned out to be. What a stroke of luck! So well done to Wasp for having (hopefully only partially) beaten me with a good puzzle. I look forward to the revelation with interest, and I hope I don’t look too foolish! Here we had the second circular grid of the year after Hedge-sparrow’s Hadron Collider puzzle. This time though, the answers could be entered in either direction; there were no jumbles here, so hopefully it wouldn’t be as tricky as most. The main problem that lay ahead was the rotation of four rings and the highlighting of a quotation. Still, it was a 10-worder so it shouldn’t be too difficult to find. Starting on the arc clues in the rings, I soon got to 16 Puzzle tester: a role for our dedicatee (6). I don’t know whether I got my suspicion from the title in the first place (unlike some, I really don’t pay much attention to it), but it seemed that here we had a puzzle dedicated to the late Derek Arthur, Listener Crossword vetter and setter (under the pseudonym Viking). Arc clues 40 and 41 also confirmed this, the Grimshaw in 41 being a reference to another Listener stalwart, John Grimshaw. That just left the endgame, and those of you who attempted it will know (I hope) what a little so-and-so it was! The six letters misprinted by the wordplay were, in order, VIKING, and the correct letters, in order, were GRLYEA. The four rings of the grid then had to be rotated so that these letters lined up to give a thematic word. Without using an anagram solver, it seemed to me that ARGYLE or LAGERY were the likely candidates. I began to get just a little disheartened as I randomly shunted the bits of paper left and right without finding anything at all useful. EXCEPT: GRAYLE suddenly appeared in front of me. How lucky, and how inanely short-sighted of me not to see it earlier. But this was getting me nowhere fast, so yet another approach was needed, and logic needed to be brought to the table. I decided that I would have to try all the possible grids one by one. 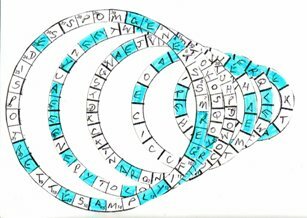 There were 2 Gs in the outer ring, 3 Rs in the second, 3 As in the third, one Y and one L in the fourth and fifth rings respectively, and 2 Es in the innermost ring. That meant 48 combinations. Oh good grief!! Now whether this was the intended sequence of trying, I don’t know, but I fixed the outer G and the inner E in place; after all they were there already. then rotated the other four rings so that the first R and A were in place together with the Y and L. Filling the grid with the remaining letters then took less than five minutes. Only another 5 hours 55 minutes to go!! 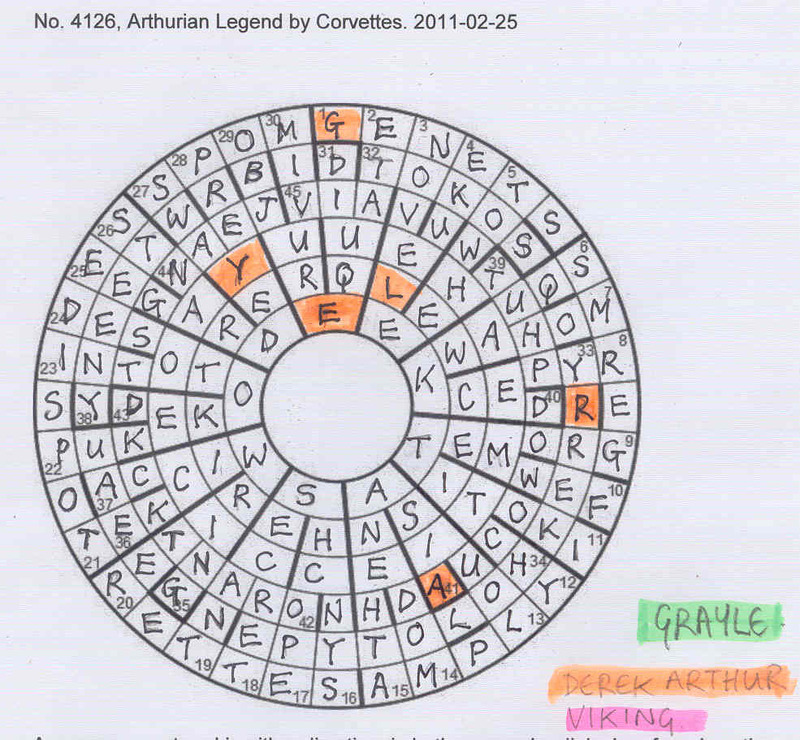 A great puzzle, and a worthy tribute to Derek Arthur from Corvettes. Fairly early on, I noticed that Corvettes was an anagram of CO-VETTERS, and was probably Roger Philips and Shane Shabankareh, the two current vetters of The Listener. Perhaps the title here was a bit of a giveaway; but what an appropriate title to go with a round table, thoughts of the holy grail and the sword in the stone. 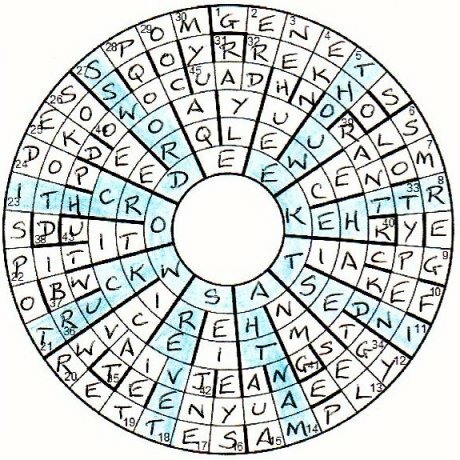 We are very fond of the circular crosswords and this one had the added advantage of arcs, though, like the CERN accelerator a few weeks ago, the clues were running in both directions. What tough clues! After working solidly until midnight, we still had a handful to solve. Finding words that fitted the definitions was not impossible but oh, the wordplay! EAU ‘Evian or Perrier? Vive la différence — with their sources it could become valued’ I don’t like composite anagrams and here we had one: VLD are the sources of Vive la Différence + EAU = VALUED. If that one was difficult, what about TOWHEE? ‘Flyer delivered two for the price of one, not once for profit, strangely’. We have to subtract ‘once for profit’ from ‘two for the price of one’ and we are left with the letters of TOWHEE! I am still not sure how we got to DECK from ‘Compliance required where one of Derek’s notes is covering the ground’. Are we putting C where a note (RE) is, to get ground covering? We fought our way through these clues and produced five misprints that confirmed our initial suspicion. We had VIKIG which converted to GRLYA. I still don’t know which N gave me the final E of GRAYLE but the theme was evident. We weren’t fortunate enough to know Derek Arthur, but know how he was loved and esteemed in the crossword world, so here was our Arthurian legend, very appropriately honoured in a round table with the thematic GRAYLE. 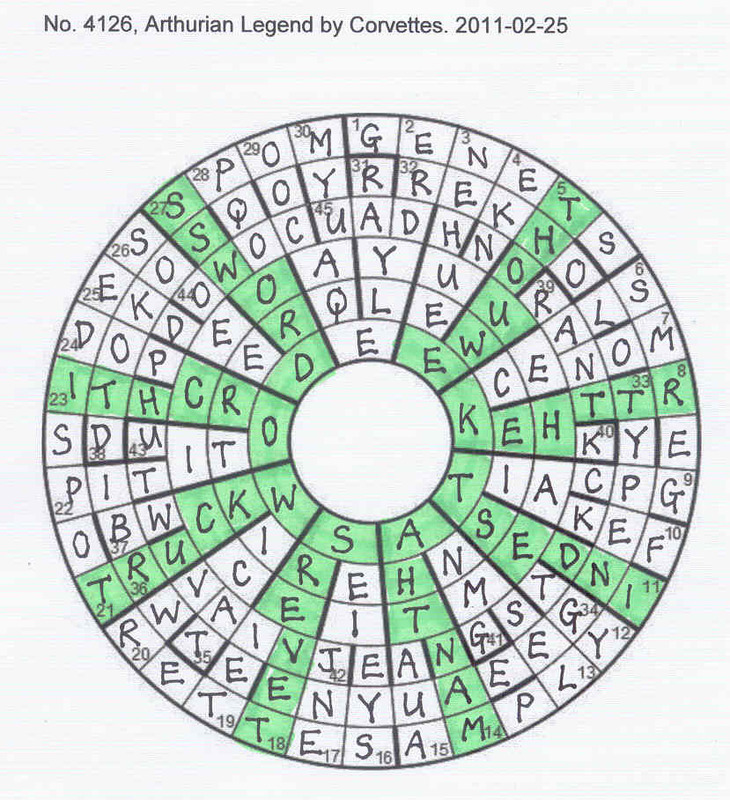 We needed a ten-word quotation and had to perform a kind of combination lock manoeuvre on our grid to produce it, so I set to with the scissors, produced six concentric circles and fiddled, then gazed in confused dismay at the muddle of letters facing in all directions. Sense finally emerged (correcting a few flawed solves at the same time – now we knew which was to enter TOKOS!) and we saw a phrase from Arthurian legend emerging – Malory’s Morte d’Arthur, Sir Ector to Sir Launcelot, “Thou wert the kindest man that ever struck with sword”. Except that here, our Arthurian knight struck with “crossword”. Rumours are rife about the nature of Corvettes; clearly no newcomer but probably a group of very able setters who were familiar with all the Listener crosswords set by Viking since 1999. That’s why we found BUMPS in 45arc, EASY in 9r, ISLE in 32arc, HOME RUN in 23r, CRACKERS in 6arc, TWO FOR THE PRICE OF ONE in5r, (just imagine the sort of brilliance that saw that ‘once for profit’ could be subtracted from that to get TOWHEE! – or did the towhee come last? ), FACTORY in 8r, LOTS in 41r (perhaps that explains what initially seemed to be a most unsatisfactory clue for ASIA – ‘Lots of land’), MASTERWORKS in 27arc and PRIMORDIAL in 14r. What a stunning construction and how appropriate that such a kind person should have such a fine crossword constructed in his memory!